Spectra, Other Shape Guitar from Black Mesa Guitars. The Black Mesa Spectra draws on the styling cues of the late '50s and early '60s "when the world stood on the threshold of space and the future was filled with promises of flying cars, personal robots and self-cleaning houses," according to the company. Equipped with hand-wound Sheptone pickups (stock setup is a P-90 at the neck and Tele in the bridge) and featuring the company's 24-fret TorsionLogic neck system, the Spectra has retro looks, classic tone and modern top-shelf hardware and construction, Black Mesa says. 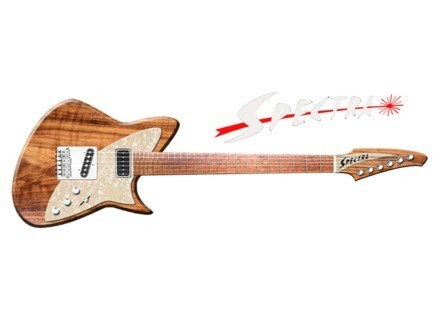 The first Spectra is available for sale on Black Mesa Guitar's website. Note that specs are subject to change. For more information, head to the Black Mesa Guitars website. Eventide PowerFactor Eventide has announced the availability of the PowerFactor. Carl Martin Octa-Switch mkII Carl Martin present the MKII version of the Octa-Switch, based on user feedback.